McDonnell Fallout Highlights Republican Party’s Leadership Woes in Virginia | News and Features | Style Weekly - Richmond, VA local news, arts, and events. Scott Elmquist Former Gov. 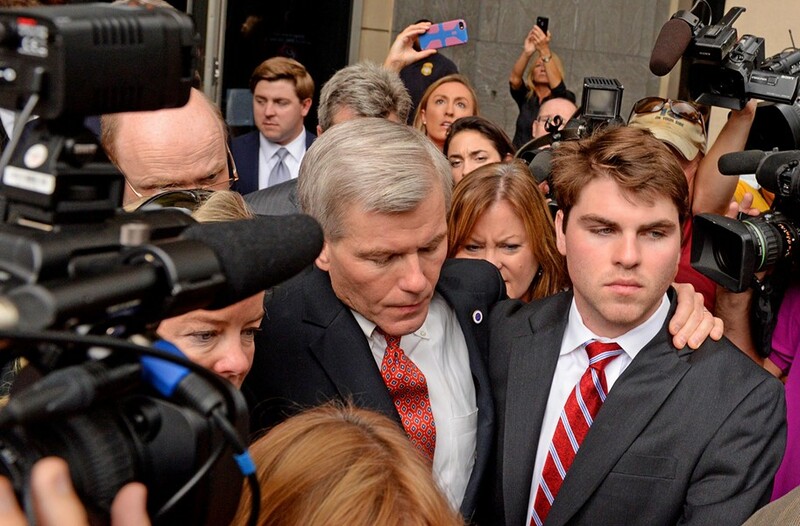 Bob McDonnell leaves the federal courthouse after his conviction Thursday, with his son Bobby by his side. For the Virginia Republican Party, it's bad enough that one of its former stars, Bob McDonnell, won the unseemly distinction of being the first governor in the state to be convicted of corruption charges last week. 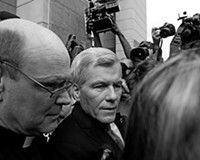 But McDonnell's conviction Sept. 4 is just one in a long string of painful setbacks that have hammered the state GOP. "The Virginia Republican party is in the middle of a profound crisis of direction," says Stephen Farnsworth, a political analyst at the University of Mary Washington. McDonnell's successor, Democrat Gov. Terry McAuliffe, defeated Republican Ken Cuccinelli last year in a campaign that brought the Virginia GOP's internal-party bickering to the fore. In June, fair-haired wonder-boy Eric Cantor, former House majority leader, lost a primary to Randolph-Macon College professor Dave Brat, a relatively unknown upstart with Libertarian and tea party backing. And Ed Gillespie, the Republican candidate for the U.S. Senate, is trailing far behind incumbent Mark Warner in the November race. Virginia's Republican Party seems clueless. It thrived for years by balancing two factions — Main Street, pro-business politicians such as Cantor versus social conservatives who chiefly focused on fighting abortion. That changed dramatically in 2010. The GOP elite was caught unawares while the tea party movement, representing a polyglot of anti-government interests, gained remarkable strength. Piling on, Libertarians, with some similar views, joined the fray. Unprepared about how to respond, party bosses stuck to the top-down dictatorial style that had worked for them for years. One reason that Brat was so adamant about challenging Cantor in the primary for 7th District congressman was because he was miffed that the GOP elite dissed him in 2012, when he wanted to replace Delegate Bill Janis of Henrico County. Without open debate, party leaders instead chose Peter Farrell, the son of Tom Farrell, the powerful head of utility Dominion Resources. Elsewhere, rank and file Republicans were miffed over slating — the process of having party leadership pick candidates for them, rather than having them elected directly. Mix in the traditional Republicans' tendency to toady up to big business, and you have rebellion. That Cantor found a job at a high-paying boutique investment company on Wall Street so quickly after resigning only underlines the point. 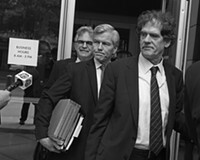 Is the McDonnell verdict a breaking point? Analysts tend to see the corruption debacle as a separate and more widespread issue, pointing to the state's woefully weak ethics laws that affect all parties. "It's more of a problem with the broader culture of things," political analyst Bob Holsworth says. McDonnell's fall, for now, seems more of a lost opportunity for the party. A widely popular governor, he might have been the figure to bring the GOP together. With him out of the picture, Holsworth sees a potential leader in former Lt. Gov. Bill Bolling, who was forced aside in last year's gubernatorial race to make way for Cuccinelli. But the fallout hasn't settled yet. "The party has a leadership vacuum," Holsworth says. "As much as Republicans hate to hear it," Farnsworth says, "they need their own Bill Clinton."